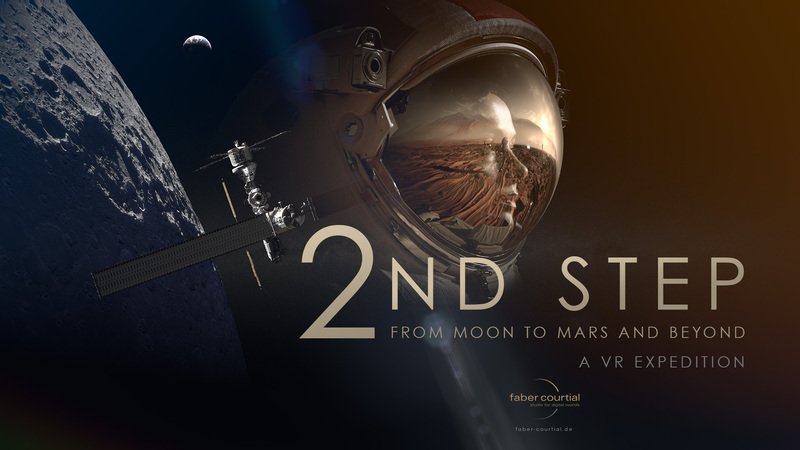 “2nd Step” is a soaring VR journey through space from moon to mars and beyond. In the film, the viewer gets a very intense feeling of being in the middle of alien, undiscovered worlds far away from earth – and to visit some of the most exciting settings of current and future space missions, such as the landing spot of Apollo 11 and the mysterious “Red Planet”: Mars. The film was produced with expert advice of the European Space Agency (ESA) which provided valuable original data for the reconstructions of the settings. Thus, it shows not only profound scientific basis, but also an unprecedented richness of detail. The next giant step will take mankind to the Moon’s South Pole. A magical shadowy realm, where the sun only rarely sinks below the horizon. There, in the depths of its craters, the lowest temperatures in our whole solar system can be found. Will totally new types of spacecraft enable us to fly beyond the boundaries of our solar system to exoplanets light years away? Will we – one day – find a second Earth deep in the cosmos, populated by extraterrestrial life forms?